Under the Hood with Tekin team driver Adam Drake – Tekin – Smaller, Smarter, Faster! 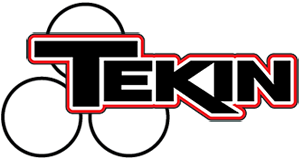 Team Tekin factory driver Adam Drake is well known throughout RC racing all over the world. “The Drake” is best known for his consistent efforts in the 1/8 Buggy scene. We take an in depth look into Adam’s TLR 8ight E 1/8 Electric E buggy. Drake’s signature paint scheme is easy to spot running around the track. Adam’s using the latest TLR 8ight 3.0 body on his 8ight E buggy wrapped up by Upgrade RC. Look at the top with the body removed you can see Adam chooses a Tekin Rx8 and Tekin 1900kv T8 motor with a Tekno Traktion Drive that Adam feels makes the car more forgiving to drive on the rough tracks he visits such as the Psycho Nitro Blast or Silver State. Adam changes between a 15T and 16T clutch/pinion setup with a 48T metal spur depending on track size and layout. Drake is also using a 4s 5400mah 35c “Sport” Thunder Power pack for weight savings. When coupled to the Tekin Rx8 and T8 1900 motor, Adam’s 8ight E lacks nothing in the power department with this combination. This allows Drake to run a car that is close in weight to his nitro buggy which helps greatly in the setup department. Thanks for checking out one of many upcoming “Under the Hoods” with the Team Tekin factory squad! « Scott Hughes wins the highly anticipated Ultra4 race!